The Most Abundant Fish On Earth Is The? The Titanic Was Discovered On A Quest To Find What? There are, as the old saying goes, plenty of fish in the sea. In fact, there are so many fish in the sea that there’s no real way to take a total census of individual fish. Our best estimates are based on the total biomass of vertebrate species using sonar scanning and other undersea observation techniques to quantify the total amount of fish in terms of biomass—with a conservative estimated global biomass of billions of tons. 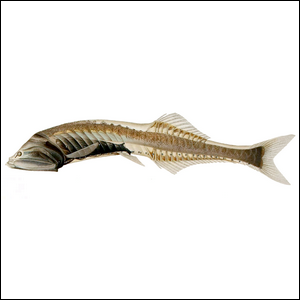 Among all those numerous fish in the sea, however, there is a particular family of mesopelagic marine fish that stands out: Gonostomatidae (commonly called bristlemouths, lightfishes, or anglemouths). The small skinny fish, named such because their mouths are bristling with numerous sharp teeth, are so numerous that researchers have been noting their incredible numbers since early exploration expeditions in the 19th century. Logs from British exploration in the 1870s noted that the bristlemouths were found all over the globe. In the 1930s, William Beebe found huge schools of them while exploring the ocean near Bermuda in a submersible. Research throughout the late 20th century and into the 21st confirmed that the tiny toothy fish were abundant nearly everywhere on Earth, and casting a net to a proper depth would yield a nearly innumerable amount of the little fish. In fact, it’s estimated that there are hundreds of trillions to quadrillions of bristlemouth in the Cyclothone genus of bristlemouth fish alone. These numbers make the fish not only the most abundant in the sea, but also the most abundant vertebrate on Earth.